Two days after their rhetorical brawl at the second presidential debate, Mitt Romney and President Obama faced off again tonight in a war of wit at the annual Al Smith dinner, poking fun at themselves and each other. "I'm pleased that the president is here," Romney joked at the top of his remarks. "We were chatting pleasantly this evening as if Tuesday night never happened." "This is the third time that Gov. Romney and I have met recently," Obama said. "As some of you may have noticed, I had a lot more energy in our second debate. I felt really well-rested after the nice, long nap I had in the first debate." Besides zinging himself over his widely panned performance at the first debate, Obama noted the pressure he and Romney are under. "In less than three weeks voters in states like Ohio, Virginia and Florida will decide this incredibly important election, which begs the question: What are we doing here?" Obama asked to laughter. The annual dinner is a traditional stop along the presidential campaign trail, giving the candidates a chance to score political points with humor as they roast each other for a good cause. The swanky white-tie fundraiser at New York's Waldorf-Astoria hotel raises money for Catholic charities in honor of former New York Gov. Al Smith, the first Catholic presidential candidate. The tuxedo-clad Romney, showcasing his knack for self-deprecation, joked, "It's nice to finally relax and wear what Ann and I wear around the house." With 19 days until the election, the quips were loaded with not-so-subtle political overtones. "We're now in the final months of the president's term," Romney said. "As President Obama surveys the Waldorf banquet room with everyone in white tie and finery, you have to wonder what he's thinking. So little time, so much to redistribute." "Of course, the economy is on everybody's minds," Obama later said. "The unemployment rate is at its lowest level since I took office. ... I don't have a joke here, I just thought it would be useful to remind everybody that the unemployment rate is at the lowest it's been since I took office." No one was spared, especially not the media. "I've already seen early reports from tonight's dinner," Romney said. 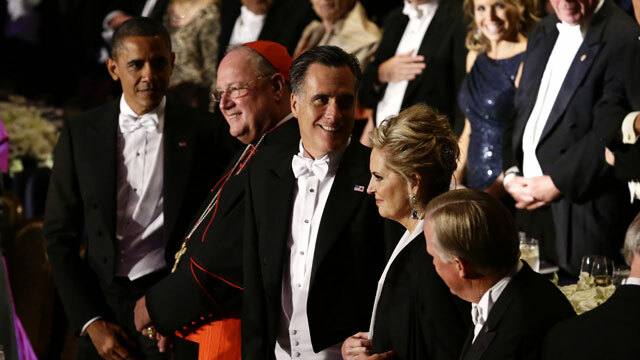 "Headline: Obama Embraced by Catholics, Romney Dines with Rich People." Romney and Obama face off again, all jokes aside, on Monday in the third and final presidential debate. "People seem to be very curious as to how we prepare for the debates. First, refrain from alcohol for 65 years before the debate," said Romney, who abstains from alcohol for religious reasons. "Second, find the biggest available straw man and mercilessly attack it. "Big Bird didn't even see it coming," he said, referencing his comment at the first debate that he would cut funding for public broadcasting to help reduce the deficit. Obama offered a preview of the upcoming debate on foreign policy. "Spoiler alert: We got bin Laden," he said. Both candidates hit the trail again Friday. "It can be a grind," Obama said. "Sometimes it feels like this race has dragged on forever, but Paul Ryan assured me we've only been running for two hours and 50-something minutes."